There is a new book on the market for PowerCLI, well I say new but really I mean updated but that does not by any means make it less valuable! The first edition of this book was a great success and I personally often ran into many people who would use this as the go to place to learn about real world examples of how to achieve common tasks with PowerCLI and how to take their PowerCLI knowledge even further. Now there is a second edition of the book with a star studded list of authors, some of which have changed since the first edition. With names like Luc Dekens, Jonathan Medd, Glenn Sizemore, Brian Graf, Andrew Sullivan and Matt Boren this book should take pride of place on any good VMware Admins desk who wants to achieve automation and make their lives easier. Where can I buy this awesome book? 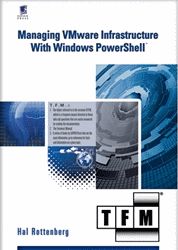 This entry was posted in Book, Books and tagged PowerCLI on February 5, 2016 by Alan Renouf.